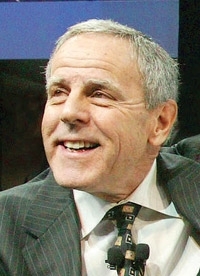 When Cerberus lured Jim Press to Chrysler in September 2007, it was assumed that the Toyota sales and marketing whiz had hit the jackpot. But it's possible that he didn't make much more than an executive of his stature might expect. The gossip began when BusinessWeek, citing unnamed sources, said Cerberus had dangled $50 million in front of the Toyota veteran. But privately owned Cerberus didn't have to say how much it was shelling out, and Press wasn't talking. Thanks to divorce court, though, one piece of the puzzle has come into view. Papers filed by Press' ex-wife in Los Angeles say his "gross salary and additional income" as of May 8, 2008, was $2.4 million a year. The filing didn't include details about two key points: any equity stake in Cerberus or Chrysler or any signing bonus Press might have received for coming on board as vice chairman and co-president. But a source close to Cerberus said last week that the company typically offers big money to executives in the form of pay-for-performance, not signing bonuses. If that's true in this case, Chrysler's distinct lack of performance and descent into bankruptcy suggests Press didn't score a monster payday.